Kidney beans are a good source of soluble and insoluble dietary fibre, a pre-biotic food that works to lower serum cholesterol, and to moderate blood sugar peaks after meals. See my page on pro and prebiotic foods to see the benefits of both types of fibre, and the disease preventing role of fibre and prebiotics in the diet. High levels of folate and magnesium in kidney beans confer protection from some forms of heart disease, and this great source of molybdenum assists the body in the detoxification of sulphites, found in preserved meats. The classic red beans and rice, where kidney or adzuki beans are combined with whole rice, provides a high quality protein source for those who don’t consume animal foods. One cup of cooked kidney beans will provide 31% of the average recommended dietary intake of protein. The following percentages of current recommended daily intake for other nutrients are: molybdenum 295%; folate 57%; fibre 45%; copper 42%; manganese 38%; phosphorous 35%; B1 23%; iron 22%; potassium 20%; and magnesium 18%. 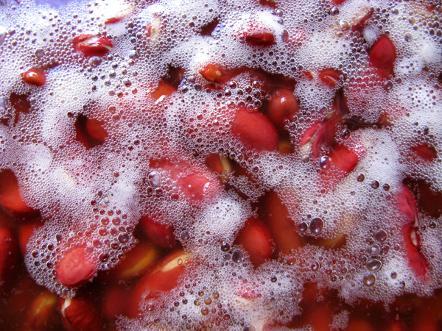 Germination and fermentation increases the nutritional benefit of kidney beans and will reduce the levels of the anti-nutrient phytic acid by more than 50%, increase protein by 38%, and increase available B1 by nearly four times. Bazzano LA, He J, Ogden LG, Loria CM, Whelton PK (2003) Dietary fiber intake and reduced risk of coronary heart disease in US men and women: the National Health and Nutrition Examination Survey I Epidemiologic Follow-up Study. Archives of Internal Medicine 163(16):1897-904. Hiran P, Kerdchoechuen O, and Laohakunjit N (2011) Improvement of nutritional values of germinated kidney bean by fermentation process. Agricultural Science Journal 42(2)(Suppl. ): 505-508. McIntosh M and Miller C (2001) A diet containing food rich in soluble and insoluble fiber improves glycemic control and reduces hyperlipidemia among patients with type 2 diabetes mellitus. Nutrition Reviews 59(2):52-5. Menotti A, Kromhout D, Blackburn H, et al. (1999) Food intake patterns and 25-year mortality from coronary heart disease: cross-cultural correlations in the Seven Countries Study. The Seven Countries Study Research Group. European Journal of Epidemiology 15(6):507-15.